First revealed back in February this year, the BR-V SE is based on the Grade V variant of the seven-seater and is offered in limited numbers. Only 300 units will be made available, with pricing for each set at RM90,700 on-the-road without insurance. 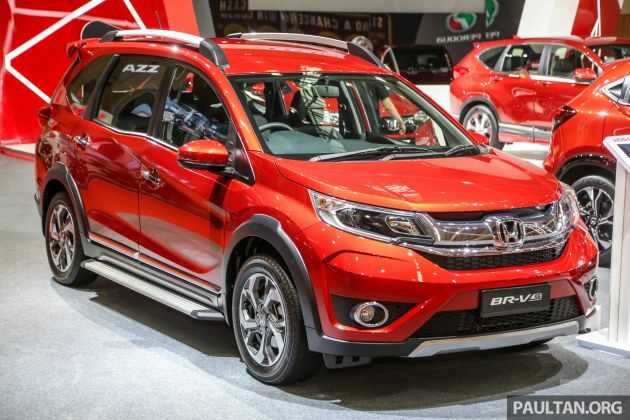 As a comparison the Grade V variant of the BR-V goes for RM87,701. In terms of enhancements, the limited-edition model comes with running boards on the sides of the vehicle, side step garnishes and a tailgate spoiler. The BR-V SE can be had with a Passion Red Pearl finish like that used on the latest HR-V, or White Orchid Pearl for an extra RM300. On the inside, the BR-V SE gets a 6.8-inch head unit in place of the Grade V’s 6.1-inch system. The rest of the equipment is similar to the Grade V variant, with 16-inch wheels, leather upholstery, automatic air-conditioning (with rear vents), dual front airbags, keyless entry and start, a reverse camera and Vehicle Stability Assist (VSA). Similarly, there’s still a 1.5 litre engine (120 PS and 145 Nm) and a CVT. My volkswagen tiguan is MUCH better. Because the tow truck will move that car for you instead of driving it. Better buy Aruz and save rm14k. Rm14k u can upgrade sport rims n some gear up kits. I rather prefer a car that is rejected by 95% of the world and only can sell in China, instead of a car that is rejected by 99% of the world that can’t even sell in China. Special Edition and Limited Edition are usually launched when sales is slow. In other words, BRV and Bezza sales is slow. Topup a bit more and you can get an X70 with more features. No brainer. They should change the rim design to make it more subtle. If you feel proton x70 better than buy x70, but if you feel Honda brv better than buy brv. Don’t criticize the car each other. Because no one can change your mind. Believe in your intuition which car is better.